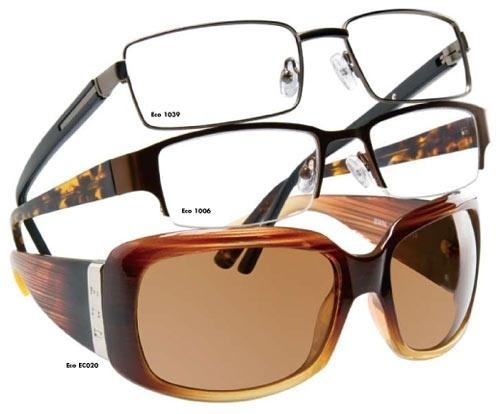 GREEN Eyewear - LINDEN OPTOMETRY, A P.C. We are pleased to present the ECO (Earth-Conscious Optics) line of Green eyewear. Manufactured from 95% recycled metal and plastics, this affordable line is your opportunity to help the enviornment while still looking your best. Even the packaging is made from recycled materials. And, we provide a recycling kit for you to mail-in your old eyewear for recycling. For every ECO eyewear frame sold, Linden Optometry A PC plants one tree. Ask for your FREE Green Grocery Bag (no purchase necessary while supplies last) when you try on a pair of ECO Sunglasses or Eyeglasses.